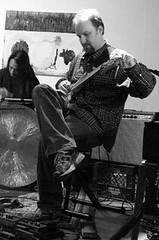 Kevin Frenette began playing music at the age of eleven and began working professionally in the 1990s. He studied guitar, composition, and music theory at UMASS-Dartmouth where he received a BA in Theory/Composition and has performed throughout the Northeast USA making music that is inspired by both contemporary improvisation and avant-garde jazz. He has performed and/or recorded with such artists as Tatsuya Nakatani, Jack Wright, Joe Giardullo, Pandelis Karayorgis, Andy McWain, Forbes Graham, Luther Gray, Jane Wang, James Rohr, Gordon Allen, Sarah Weaver, Harvey Sorgen, Brian Melick, Michael Snow, Dan DeChellis, Gwen Laster, Larry Packer, Martha Colby, Lori Freedman, David Gamper, Al Margolis, Ryan McGuire, Jeff Kimmel, Adam Dotson, Joe Moffett, Chris Vellieux, Ricardo Donoso, Jules Vasylenko, Jonathan LaMaster, Andrew Hickman, Eric Platz, Todd Keating and Gabe Cabral.